okay, so maybe i’ve been on a soup kick all week, is that so awful? i agree that it isn’t, which is why i kept on with it today when we ordered in panera bread for my client training session. like always i went with the you pick two, selecting the thai chicken salad as one of my options. it was when i was trying to make my other selection that there, on the order screen, was a picture of the vegetarian autumn squash soup, and my heart was aflutter. it looked rich and savory and i just had to have it! i brought my brown bag back to my desk and opened the lid with much anticipation. first, the smell alone was so warming. wisps of cinnamon and curry floated up to me, and i dove right in with my spoon. it was thick with all that pureed squash and pumpkin, and the honey and apple juice helped sweeten it up just a skosh. the chewy pumpkin seeds were a nice surprise with each bite, and i was glad i had ordered the bowl size instead of a cup – it was that delicious! 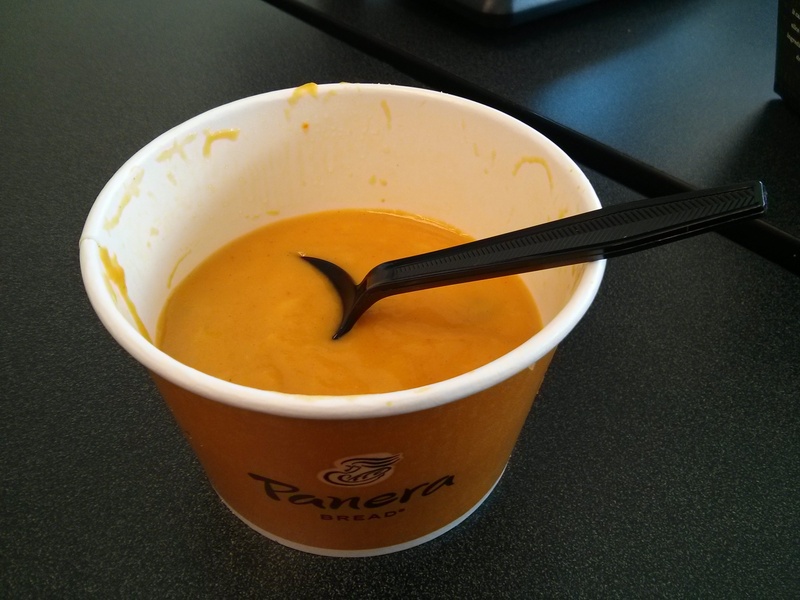 if you are a soup-lover like me, i highly encourage you to give this one a try the next time you find yourself hooked up to the wifi and catching up on your personal e-mails and netflix series at a panera bread. it’s perfect for those cool fall days and will bring calming thoughts of slippers and gloves and scarves to your sweet little mind.